A car has collided into a Lincolnshire Co-operative store in Lincoln this morning. The incident happened late morning on November 9 at the Monks Road Co-op, involving two cars. According to staff who witnessed the incident at the store, a male driver in a red car was travelling on the wrong side of the road, into oncoming traffic. 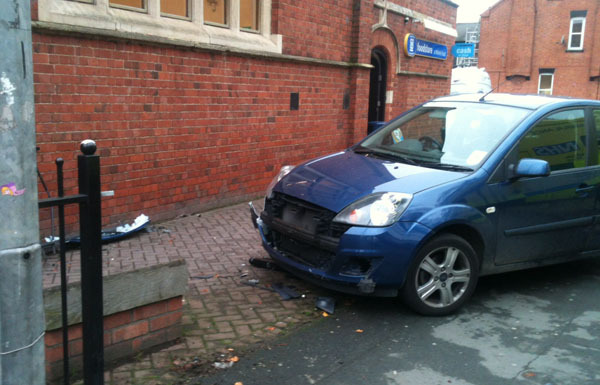 A female motorist swerved to avoid the driver, but careered into the metal railings outside the shop. Lincolnshire Police and East Midlands Ambulance Service attended the scene, but no-one was seriously injured. Anyone with information should contact Lincolnshire Police on the new non-emergency number, 101.